This just dropped off a 복족이 for me. But perhaps it's most OVERPOWERING use is that it can make the 장난감 기차 invincible as long as you're doing doughnuts on top of the tracks! it will eat 열차 파괴 태엽돌이 and 꼬마 해체자 TOO! The only 2 means of removing a train. Unfortunately after further testing it seems that even though you can kill the wrecker, it usually get's it's attack off anyway. Still, it's better then nothing. There are five 복족이 NPCs on the way to 지쿤, and based on the drop rate listed on this page, there is approximately a 1/125 of any given 복족이 dropping a 복족류 껍질. 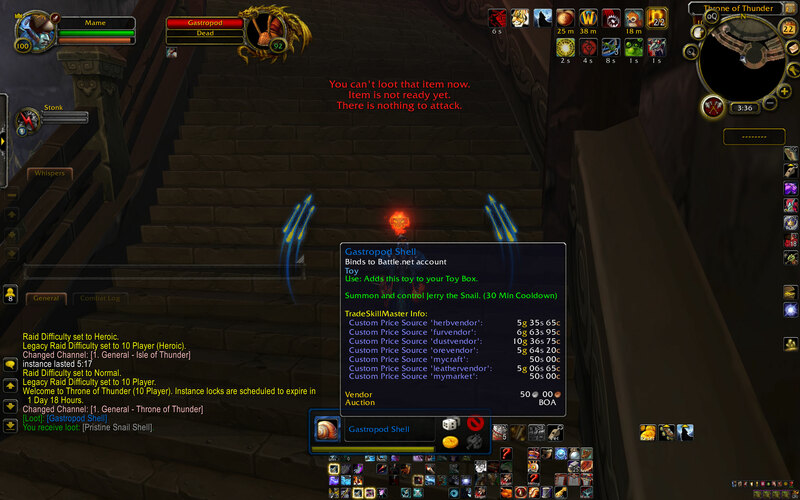 지쿤, on the other hand, has approximately a 1/100 chance, per kill, of dropping the mount: 지쿤의 자식]. Without specifically farming for the 복족류 껍질, clearing the trash for 100 Ji-Kun kills (which only nets you a 63% chance of seeing a 지쿤의 자식) will mean killing 500 Gastropods in total for a whopping 98% chance of seeing at least one 복족류 껍질 drop. Therefore, if you want 지쿤의 자식, and are capable of soloing 지쿤 on multiple characters a week for it, you will most likely get the 복족류 껍질 long before you see the mount drop, and you would most likely be wasting your time by specifically seeking it out. After all, by the time you get your 지쿤의 자식, you may have gotten another 복족류 껍질 along the way! The easiest way to reset the instance to farm the trash snails for this is to start a "Realm Hop" group and convert to raid when someone joins. From there, when finished killing the five 복족이 in normal, you can set to heroic, decline to port out, set to normal, reset instances, enter, and repeat.